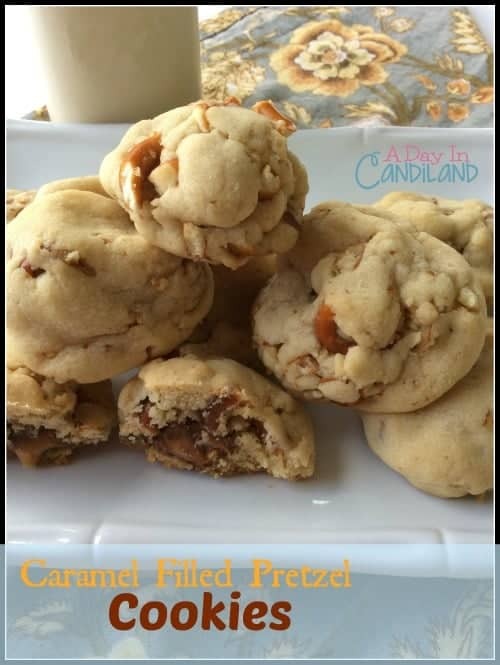 Caramel Filled Pretzel Cookies stuffed with a Rolo is what you get with these delicious cookies. Made with Brown and granulated sugars, crushed pretzels wrapped around a Rolo. What else could you want in a cookie? Find these and other dessert recipes here. This weekend I made these amazing Rolo cookies after I was asked to bake for our new families at our school. We are having back to school night tomorrow and they welcome all the new families with a basket filled with cookies and treats. I think it is really a nice touch. I made these cookies in a few hours. The longest time it takes is the refrigeration time. You form the cookies, place them in the fridge and a few hours or days later you can bake them off in 10 minutes. They were really simple and I was able to make a few extra for the family. 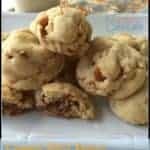 I really liked that the recipe made 4 dozen cookies, that is a great amount to give away and keep some yourself. A delicious pretzel cookie wrapped around a caramel Rolo. A combination of sweet and salty. Try to eat just one. 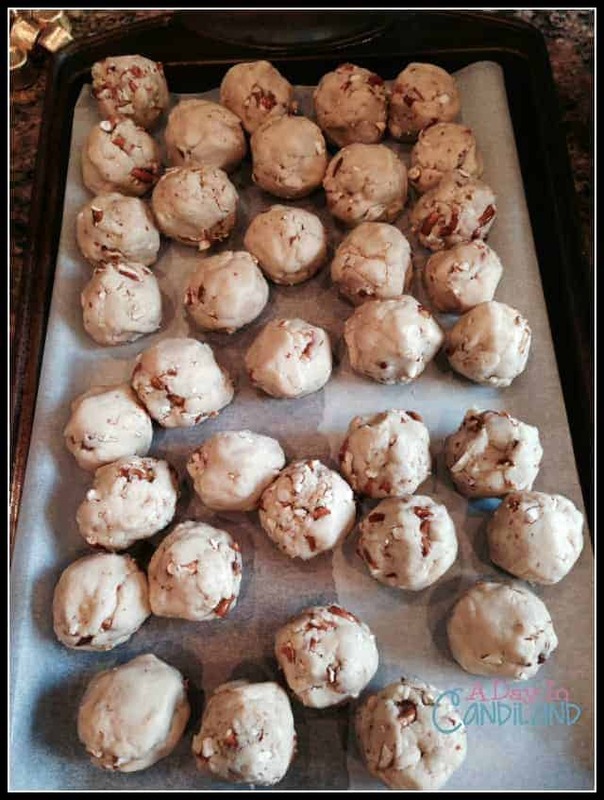 Preheat oven to 350 and grease or use parchment paper on cookie sheet. Cream butter and sugars together in a large bowl. Beat in eggs and vanilla. Stir until combined. Stir in crushed pretzels. 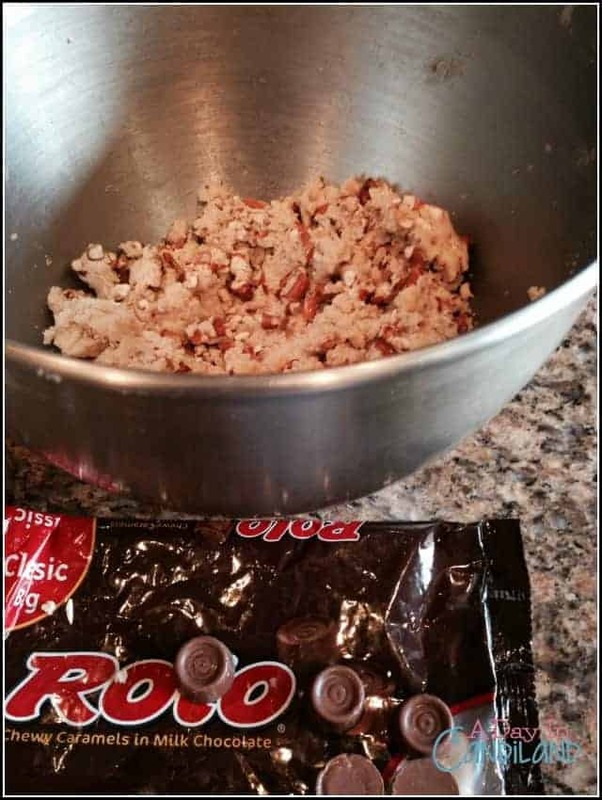 Use about 1 TB of dough, roll each ball around a Rolo, completely sealing the candy inside the dough. Chill for at least 2 hours or up to a couple days if you don't want to eat them right away. Bake for 8-11 minutes until edges are lightly brown. Place 3 cups of pretzels in a large baggie and using a rolling pin crush until small pieces remain. Do you love cookies? Try these also. 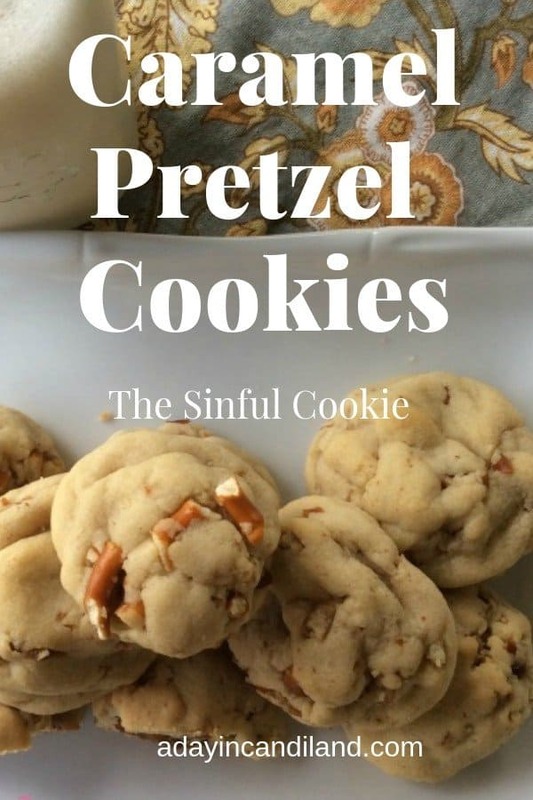 Enjoy this Caramel filled pretzel cookie recipe and also try some of my other Caramel recipes. Here are some of the items I used in making these cookies. They look delicious! Thanks for sharing these cookies with your readers. You have no idea how excited it makes me to see these cookies turn out for you. I had someone comment on this recipe on my blog today totally tearing it apart for how awful they turned out and it makes me feel so much better to know they worked out for you and you liked them! You made my day! They worked great and we ate all the left overs. These look fantastic! I'm going to have to bake these up STAT! I love how the pretzels are just mixed right into the dough but there's still another surprise center! They are so good and easy to make. I love the salty/sweet and chewy/crunchy combos! I'll bet these are killer! Yes, the two tastes work well together. OMG I am so making these. I have a package of rolos lying around here somewhere. You better make them quick before the rolos disappear. Yum! I've made cookies with Rollo candies in them before, but never thought of including pretzels. I bet some other cookies would taste delicious with the pretzel addition, as well! I think their are lots of wonderful things we could create with sweet and salty ingredients. Thanks for stopping by. OH MY! These look so delicious. Pretzels and caramel are the perfect combination. Pinned! Thanks for pinning Melissa, I am glad you stopped by. They are so good. I love to just eat rolos by themselves too. I’m not a huge caramel fan but I do love rolos. Sounds delicious! These cookies look so moist and I love the sweet and salty combo!Pinned!